How many hours on Saturday afternoons did I spend playing real time video games on the Atari 2600 way back in the day? We had a circle of friends that each had a console, and we would scour the local game stores for the latest games. We especially got excited when a brand new company -- "Activision" -- started selling games that had graphics, gameplay and themes that were all superior to the original Atari offerings. So for any former video game player-turned-board gamer, a holy grail exists. Are there any board games with real time elements that can simulate a video game yet have the tactile cardboard of a board game melded together? A few board game designers have tried to various degrees of success. Enter Cosmic Factory, the new game from Kane Klenko, designer of such hits as Fuse and Flipships. The game is published by Gigamic, and is available at retail right now. The game plays 2-6 players in about a half of an hour including game teach. Can Cosmic Factory inject just enough real time elements to satisfy my younger video game brain, but still have those strategy elements that satiate the board gamer in me? Let's find out. Note: Gigamic was kind enough to provide Board Game Gumbo with a free review copy. Also note, the game was originally released in Europe under the name "Kaosmos" but quickly changed to Cosmic Factory in the last part of 2018 before the North American release. The games that I have played designed by Kane Klenko all skew toward relatively simple instructions, a feature I love. Cosmic Factory fits the bill. Players each have a player board that consists of only two things: a track of numbers from one to thirty, and four different scoring reminders. (Once you know the game, you could essentially play the game just from the player board without the rules.) The scoring reminders deal with four different ways to score points during the rounds: collecting green, blue, orange planets in collective zones, or collecting "star points" by stringing together tiles with asteroid belts on them. The game plays over five rounds. Each player will take nine tiles, with the tiles showing pictures of green, blue and orange zones, some filled with planets, others with no planets at all. Each tile also may have a constellation on it, which is like a barrier to creating these matching color zones. Finally, tiles may have asteroid belts, which serve as "walls" or "barriers" to connecting planets in the same color zone. There are a couple of cool twists, however. First, if you think that you have the most planets of a particular color (or will at the end of the timer), you can grab that matching colored tile out of the center. The bet you are taking is that you will be first or tied for first, and if you are, you score a bonus three points. If you are wrong, you lose points. The trick is that you can't change your mind once you pick out the center tile, and only one person can have that tile! The other twist is what makes this game infinitely replayable. For each round, players will turn over a round card, called a "chaos card", which breaks the rules of the game. You might have to build two two-by-two grids instead of one three by three, and discard the extra tile. You might score more points for green, blue or orange planet zones this round. You might even be forced to build all of your galaxy in one straight linear line, a real challenge! At the end of five rounds, the winner is the person who scored the most points -- but the only points that count are the star points AND the lowest scoring of any of the three colors on the track, a favorite trick of Dr. Knizia's puzzle games and a well implemented puzzle here. Instead of cardboard chits for the scoring markers, the game comes with nicely crafted colored wooden pieces representing the blue, green and orange planet scoring tracks and little white stars that remind me of sixth grade class projects back at Mamou Upper Elementary. A small sand timer is included, plus a whole box of chaos cards. Remember, you only need five per game, and they will be randomized on a shuffle, so it will take you a lot -- I mean a LOT -- of games to actually play through all of the chaos cards. I've played Cosmic Factory at all player counts except the six player version. (I hope to get a game in 6P Cosmic Factory at our Beer & Board Game night this week, so come on by if you want a chance to play.) The reactions have been "pleased to play" all the way to "let's play again." What has been attractive about the game is that it is (a) just so dang easy to teach; (b) the rounds only take one minute; (c) the freakin' chaos cards scramble up the game play on every round; and (d) whether you score a lot of points, win the game, or come out dead last, each round you are going to score some points so there are positive feelings about the direction you are going. Let's unpack that for a second. For a game of this length and this style of play, the game play has got to be easy to get across to new players. The worst case scenario would be having a beer & pretzels game like this be so convoluted with picayune rules as to make it a slog to teach and play. Thumbs up for Kane Klenko in this department; I'll bet that there was a lot of development behind this game streamlining it into exactly what was needed to maximize the fun yet maintain the strategic elements, because you can teach this game in just a few minutes. The hardest part is teaching the scoring, but I have found that walking through everybody's board on the first turn is essential. It never seems like word explanations carry the day -- this is a visual puzzle, and you need to show, not tell, how the scoring works. Yes, my wife complained that the game was stressful the entire time we played a four player game. But at the end, she beat me by two points, yelled out "Ha!" and said "let's play that again on date night." So, obviously the game has the stress that any real time, timer game has, but not so much that it takes the fun and enjoyment out of building the puzzle. That brings me to the chaos cards. Oh, those freakin' chaos cards, how do we love and hate you at the same time. Some are easy -- score an extra point every time you build a successful green zone. Some are diabolical -- your neighbor will turn over one of your tiles, and it will probably be the one that got you the orange scoring chip, so instead of scoring five points from the orange zone AND the three points for the most orange planets, you will lose points. But all are fun, and thinky, and freshen up each round of every play. Cosmic Factory fills that niche. Newcomers will find the combination of a spatial puzzle, with the easy pace of the pass-and-play mechanic, plus the Knizia scoring, to be a good intro into all of those categories of games. Experienced players should find that there is plenty of meat on the bones of this game, even with its sub-25 minute filler status. Sure, Cosmic Factory is likely not going to make someone's top ten games of all time (although it might be a contender for someone's top ten filler game), but it has all the makings of a sleeper hit for gateway and filler game aficionados. 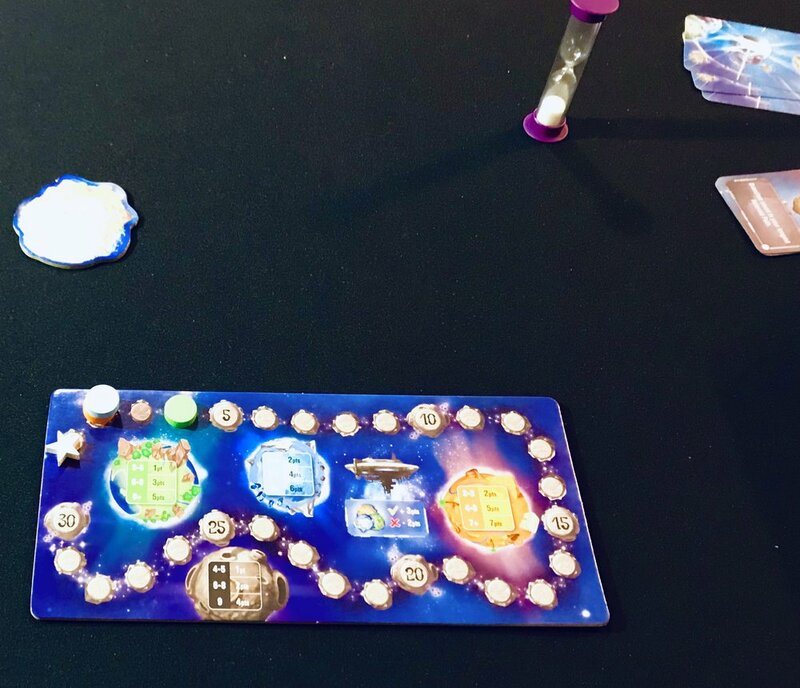 Cosmic Factory: it's fun, it's frenetic, and it is a meaty filler and a great way to open or close a board game meet up.